We present “The Outcasts of Poker Flat” by Bret Harte. Here is Jim Tedder. John Oakhurst was a gambler. He had lived in the small western town of Poker Flat for only a short time. He had defeated many people at cards. He had also won a lot of their money. For that reason alone, he was not well liked. On the morning of November twenty-third, eighteen fifty, he saw some men talking as he walked down the main street of town. As he came near, they got quiet. He said to himself, “Hmmm, I guess they are talking about me. And that can’t be good.” Oakhurst was right. Some of the town’s leaders had met secretly and decided to force some people to leave. They thought Poker Flat would be a better place to live if those people were gone. Besides Oakhurst, two women of low morals were led to the edge of town. They were the “Duchess” as she was called, and “Mother Shipton.” A man called “Uncle Billy” was added to the group. He was known to drink too much. Some people thought that he had also stolen some gold. They had no proof. But that did not matter. Uncle Billy was just no good, and he had to go. The “outcasts” were told that if they ever came back, they would be killed. So, the four of them slowly rode out of town. The “Duchess” cried and said she would probably die on the road. Mother Shipton and Uncle Billy cursed. “Mother” said she would like to “cut the heart out” of the people who done this to them. But John Oakhurst rode in silence. He thought all of life was a gamble. He had just run into some bad luck. That was all. 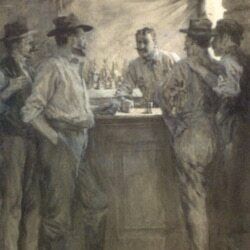 An picture of men at a bar used with one of Bret Harte's stories in Harper's magazine in 1902. The outcasts were headed for Sandy Bar, a camp not too far away. But it was high up in the cold Sierra Mountains, and the path was anything but smooth. Around noon, Mother Shipton became so tired she fell off her horse. She said that was as far as she was going today. Oakhurst tried to make them move on because they had no food or fuel. But the three would not listen. Instead they began to drink alcohol that Uncle Billy had hidden. Soon they were quiet and asleep. Oakhurst did not drink. He stood nearby and watched them. He began to think about his life and about how lonely he was. Yet he was stronger than his three companions. He could have left them there and set off alone. But he did not. Then, he heard someone call “John Oakhurst.” A young man named Tom Simson came riding up. The gambler knew Tom. They had once played cards and Oakhurst had won. But after the game, he told young Tom that he was too easy to beat. And he gave him back his money. Tom said Oakhurst would be his friend for life. Tom was not alone. From behind a tree came his new wife, a girl named Piney Woods. Her father had not wanted her to marry Tom. So they had run away. Tom told Oakhurst that he had a little food. He also showed him an old log house just off the path. Years of harsh weather had nearly ruined it. But it was all they had, and it would have to do. The women could spend the night in there. The men would make a fire and sleep on the ground by the door. The night seemed to pass quickly. But the weather became colder. The wind increased, and it began to snow. Oakhurst had a bad feeling. He turned to where Uncle Billy had slept, and found him gone. He had left the others and even taken their horses. Oakhurst said Uncle Billy had probably gone for help. But he knew better. The group of five decided to wait for the snow to stop before traveling farther. They no longer had horses. From here on, they would be on foot. By the third day out from Poker Flat, the snow had gotten deep. They could no longer see the path. Food was running low. Everything around them was white and cold. One week later they still had not moved. The snow had continued to fall and was deeper than ever. And it continued to fall. It formed a prison they could not escape. Still, they could see smoke rising from the warm fires in the houses down below in Poker Flat. The site seemed especially cruel. But the little group of outcasts tried to keep up their spirits. They tried to stay as warm as they could. They sat together by their own open-air fire. And Tom Simson pulled a small accordion from his pack. Piney Woods played the instrument. They all sang songs. The music took on a defiant quality, a quality of resistance. But the outcasts had to listen to the sad cries of their mostly empty stomachs. The hunger got worse with each passing day. At midnight on the tenth day, Mother Shipton called Oakhurst to her side. She said, “Give this to the young ones.” In a bag was all her food. She had not eaten for days. She had saved the food for the others. She turned quietly to the wall of the log house, and died. At that time of year, daylight did not last long. When night came, Oakhurst had not returned. The two women were too hungry, weak, and cold to even add more wood to the fire. They passed the stormy night holding each other close. And that is the way they were found the next morning when help arrived from Poker Flat. They had frozen to death during the night. The rescuers from town said that they had been right to force the outcasts to leave Poker Flat. But they never thought the punishment would end up like this. Justice was one thing, but freezing people to death was not their aim. And then they thought of the gambler. Where was he? What had happened to him? They searched as best they could. And then, they found him. Oakhurst sat there, cold and still. They said he looked peaceful. A single bullet from a small hand gun nearby had ended his life. John Oakhurst had been both the strongest, and the weakest, of the outcasts of Poker Flat. “The Outcasts of Poker Flat” by Bret Harte was adapted for VOA Learning English and read by Jim Tedder.